Weavers are small, finch-like birds, 4.3 to 10 inches (11 to 25 centimeters) in body length. Weavers are closely related to finches (family Fringillidae) and are sometimes referred to as "weaver finches." Other common names for various genera within the family include queleas, fodies (in Madagascar), bishops, malimbes, mynas, and widowbirds. They are called "weavers" because of the complex, elaborate nests that various species build. The weaver's beak is short, sturdy, massive, and conical, like a typical finch's beak. The legs are short and resemble those of passerines, except that in some species the feet are larger. The tail is usually long, occasionally as long as the head and body, or even longer, as in the widowbirds. 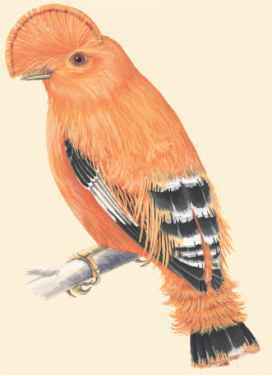 Weavers could be described as finch-like birds in tropical dress. A few are dull in color, while many others are brilliant and unique, the brightest and most widely seen colors being yellow, orange, and red. Males tend to be more colorful than females. The grosbeak weaver is mainly dark gray with white patches on its forehead and outer edges of the wings. Widow-bird species have long, loose, elaborate black tails. Males of most Ploceidae species change colors during the breeding season, from duller to more vivid, changing back to the duller coat when the breeding season over. The dull phase plumage of the male looks very similar to that of the female, which does not change color. A male red-collared widowbird, in the nonbreeding seasons, is colored light brown on its sides, under parts and head, with dark gray wings, a yellow streak over each eye and yellowish on the cheeks, but the breeding plumage is shiny black with a bright red-orange collar across the throat, extending upwards in two broad red bands near the back of the head, and forming a red cap on the crown.